October is Virginia Wine Month, which is an official reason to indulge in all things vino in Virginia’s Blue Ridge. Our area wineries are diverse, scenic, and perfect destinations for responsible day drinking with friends. Bring your pooch, your mom, your man, or even your kids for grape stomping, live music, and more. The clock’s ticking; don’t miss out! 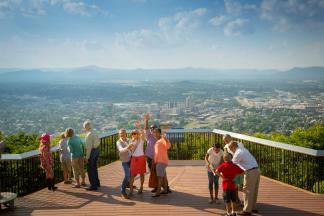 Here are eight ways you can celebrate Virginia Wine Month in the Blue Ridge Mountains. 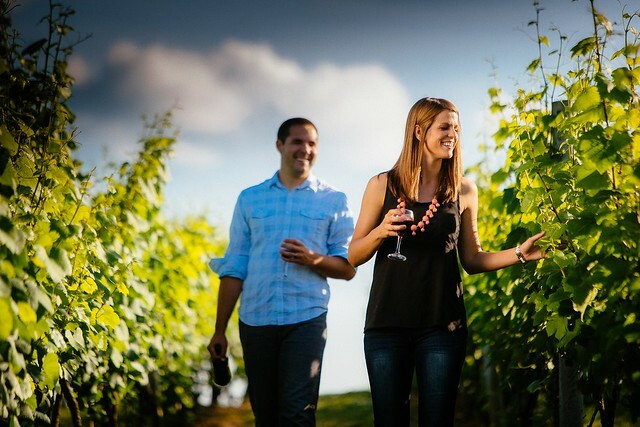 Multiple local wineries highlight this tasty and scenic tour, which also offers “behind the scenes” opportunities to get an intimate view of what it takes to make award-winning Virginia wine. Plan to spend a little more than five hours sampling a flight of at least six wines at each location, plus be treated to a full glass of your favorite, plenty of water, and snacks on the bus. If you’d prefer a boxed lunch, that can be arranged as well. Grab 13 of your closest friends and let’s go wine touring! 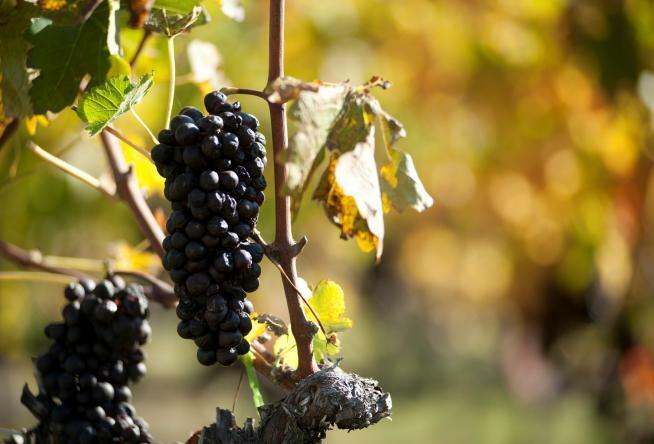 Three wineries make a tour along the Wine Trail of Botetourt County a fun, easy to do day trip in Virginia’s Blue Ridge. Blue Ridge Vineyard, Fincastle Vineyard & Winery, and Virginia Mountain Vineyards are small, family-run farms dedicated to crafting excellent vintages. Evening music, special events, and bucolic landscapes ensure you’ll return again. Note the live music available at Blue Ridge Vineyard each Sunday, April through October, and the upcoming Wine, Moon & Stars night at Virginia Mountain Vineyards. If you’re searching for a hard-to-find, cheap, or expensive bottle of wine, the chances are good that one of our local wine shops will be able to assist you in your quest. Food pairing recommendations, special sampling events, and educational opportunities are beneficial services offered to the novice sipper and elementary shopper. Let our wine experts lead you to something delicious. 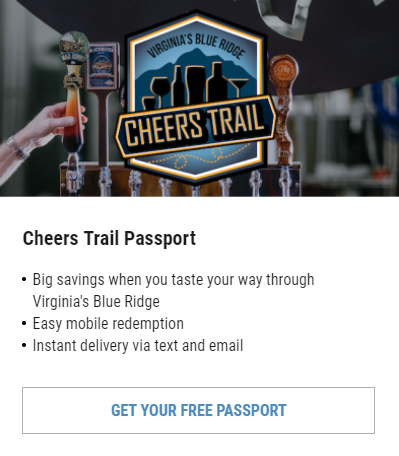 Check out Wine Gourmet on Electric Road in Roanoke, Mr. Bill’s Wine Cellar on Brambleton Avenue in Roanoke, or Eli’s Provisions on the Market in Downtown Roanoke. A little wine sparks creativity and removes any nervous emotion you may have about gettin’ your paint on. Gather your girlfriends or make it a date night. You’ll have a blast as you’re led through a specific piece. You may think they’ll all turn out the same, but you’d be wrong. Each of you has a Rembrandt just waiting to emerge. 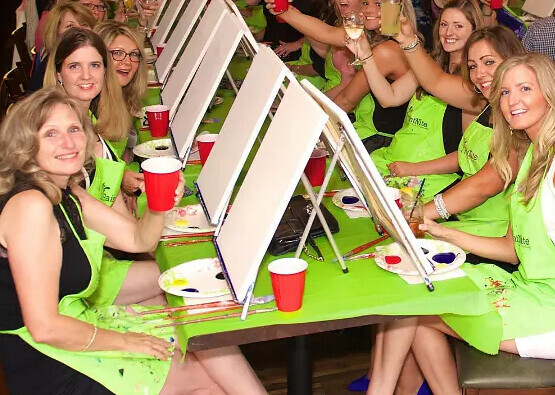 Paint Nite Roanoke hosts events throughout the region and previews the upcoming canvases on their online calendar. Find the one you want, register, and get ready for a fun night. The Blue Ridge Parkway is known as “America’s Favorite Drive” thanks to the scenery and slow pace it offers. It’ll be your favorite drive, too, as you make your way to some of our favorite wineries and find unexpected delights as you go. North of Roanoke off Milepost 86 is Peaks of Otter Winery in Bedford. Fresh-from-their-orchard fruit is the focus of their wines. Enjoy a flight while admiring the view of the Peaks of Otter. In Roanoke County along the Parkway on Route 221 in Bent Mountain is AmRhein’s Wine Cellars. Their German-influenced collection of 15+ red and whites give you plenty of tasting options. Mark your calendar for their Oktoberfest: A Moonlight Grape Stomping Event! Chateau Morrisette Winery is one of Virginia’s oldest and most beloved wine destinations. Find it at Milepost 171 in Floyd in the southern part of Virginia&apos;s Blue Ridge. Take your time touring and tasting, and be sure to enjoy a meal at their fine restaurant as well. Traveling on Sunday? You’ll be delighted to find live music! If a winery visit seems a little intimidating, try wine with dinner. Restaurants like Local Roots, Rockfish Food & Wine, and Tizzone Wood Fired Kitchen & Wine Bar offer wine flights, which will help you choose something that suits your palate. The best part of all three restaurants is how they source their food: LOCALLY! The aforementioned Chateau Morrisette boasts a beautiful restaurant, and in Christiansburg, Whitebarrel Winery & Restaurant offers a delicious seasonal menu. They’re open Wednesday through Sunday and their tapas style farm-to-table approach is a delightful treat. Try the Vidal-seared Virginia diver scallops paired with Vidal blanc or Chardonnay. You may find a bottle of wine you really love, or you may be inspired to take one home for the purpose of crafting a quaff. If you’re more of a cocktail person than a wine person, this is for you. Peaks of Otter’s Salty Frog Margarita – Rub your glass rim with lime and dip in salt. Toss in two ice cubes and chilled Salty Frog Margarita wine. It doesn’t get any easier than that. You can also use this recipe from Chateau Morrisette to make an amazing pitcher of sangria! Combine wine and sugar in a pitcher, stirring to dissolve the sugar. Add orange juice, lime juice, orange slices, lime slices and any optional fruit. Let stand covered in refrigerator several hours or overnight. Just before serving, stir in lemon-lime soda. Serve in a 16 oz glass filled with ice and garnish with maraschino cherry. Makes 5 servings. A local winery is a great spot to spend a Blue Ridge Day at a special event or festival! Many vineyards and wineries in the region host events and live music throughout the year, including during the busy fall season. You can join the fun at Beliveau Estate Winery&apos;s Hallowine Party, an annual celebration with live music, costume contests, and delicious wine. Watch for more great wine opportunities in Virginia’s Blue Ridge by subscribing to our e-newsletter. You can also visit our Wineries page to learn more about the local vineyards and wineries in the region. If you visit a local winery, take a pic and share it with us on Instagram by using our #BlueRidgeDay hashtag!